Where there’s light there’s heat! | Real people don't hire architects...? Where there’s light there’s heat! Just in case you didn’t know, a heliostat is “an instrument consisting of a mirror mounted on an axis moved by clockwork by which a sunbeam is steadily reflected in one direction.” In the video the light is directed in a way that spreads it onto an area of a building that would otherwise be in shadow due to either location or adjacent buildings. Light is reflected off of the curved surface of the mirror in a way that all the reflections intersects at a single point. This is where the solar collector is mounted in order to harvest the maximum amount of energy. This is a somewhat unusual application of a heliostat as these are more often used to concentrate rather than spread light out. Which they do based on the optics of the impacted surfaces. Any child with a magnifying glass can tell you about how this is done. My brother started a brush fire like this once. I guess this could be called a modified heilostat as the light is first magnified, which is probably a misnomer as it is really being concentrated by the optics of the glass through which it passes. When the light gets concentrated so does the heat. It all comes down to a basic rule about light, taught to architects in school, which states that, for specular reflection, the angle of incidence equals the angle of reflection. This concept has always provided me with a source of entertaining mental gymnastics, not so much for the ability to move light into unexpected places, as for the accompanying source of heat. I kept thinking it would be a way to heat the house. At the time, I was a student, and my son just a child. 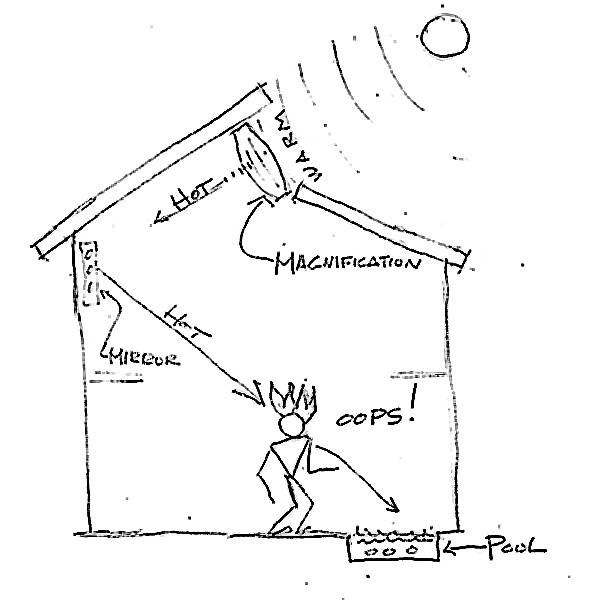 We sometimes meandered through the neighborhood speculating on how a big magnifying glass might be installed in some roof so that the heat from the concentrated light might be directed toward an interior pool. My son loved the idea of a pool in the living room and I thought that it was really just hot water heat. When we describe the idea to my husband, he said were apt to set the house on fire.